National Poison Prevention Week (NPPW), the third week in March each year, is a week nationally designated to highlight the dangers of poisonings and how to prevent them. Use NPPW as a time to raise awareness in your community about ways to prevent unintentional poisonings. Use NPPW as a time to inspect your entire home for any medicines or household products, such as detergents, cleaning products, pesticides, and chemicals that may not be stored properly and correct the situation immediately. Always store medicines and household products up high, away and out of sight from children. 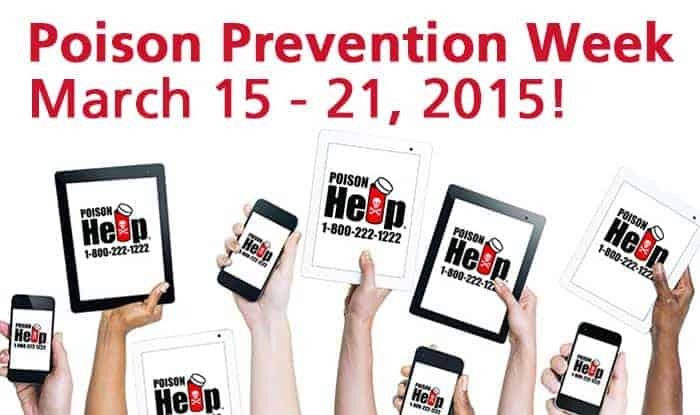 Program the Poison Help line into your phone (1-800-222-1222) so you are prepared in the event of a poison incidence. In honor of this awareness week, the National Poison Prevention Week Council offers a nationwide poster contest. The contest is open to all Kindergarten through eighth grade students throughout Missouri and the other 49 states. The primary objective is to increase awareness of the poison center services available and to educate the public about poison prevention. The winning poster in each grade category will be used as a national poster with a list of Poison Prevention Tips during Poison Prevention Week 2016. More contest information and 2015 Poster Contest Winners can be found at www.poisonprevention.org. The Missouri Poison Center also sponsors a poster contest for schools in St. Louis City and County. The “Missouri Poison Center Poster Contest” contest is open to all students in kindergarten through fourth grade from any school in St. Louis City and County. All posters from each school may be sent together. Posters may be mailed or hand-delivered during business hours (9 a.m. – 4:30 p.m.) to: Missouri Poison Center at 7980 Clayton Road, Suite 200, St. Louis, MO 63117. Posters must be received by Friday, Feb. 27, 2015. Posters will be judged on creativity, originality, neatness and poison prevention message. The themes of the poster contest are “Children Act Fast, So Do Poisons” and “Poisonings Span a Lifetime.” Posters with general poison prevention message(s) are also encouraged. Entries should illustrate a message that communicates that poisonings can happen to people of any age including children, adults and the elderly. If you have any questions please email: Peggy_Kinamore@ssmhc.com. One poster will be selected as the overall Grand Prize Winner. Four runners – up (one winner from each grade level) will be selected as 1st place winners. Six posters will be selected as Honorable Mentions. The Grand Prize Winner will receive a one-year family membership to The Magic House-St. Louis Children’s Museum, a Pointer’s Pointersaurus Pizza party for his/her class, Mr. Yuk t-shirt and a surprise goodie bag. The 1st Place Winners will receive a Ted Drewes Frozen Custard party for his/her class, a Mr. Yuk t-shirt and a surprise goodie bag. The Honorable Mentions will receive a Mr. Yuk t-shirt and certificate. The winning posters and honorable mentions will be displayed during Poison Prevention Week. Posters must be at least 81/2″ by 11″ in size and no larger than 11″ X 17″. The posters can be horizontally or vertically oriented, and any medium may be used. The Missouri Poison Center will mail posters for any teachers who are interested in your student’s posters being forwarded to the National Poison Prevention Week Poster Contest in Washington, D.C.. For more information, visit the National Poison Prevention Week website at: www.poisonprevention.org.